St. Hubert High School students Katie McGovern (left), a sophomore, and senior Ryan Doherty are proud of the robot they helped build through the school's robotics club. Not everything one learns in school comes out of textbooks. Some subjects that are more hands-on could have real future implications, and they can be really enjoyable. Take St. Hubert Catholic High School for Girls in Northeast Philadelphia, which offers classes in fashion design and robotics. The first uses good old-fashioned 19th century technology, the sewing machine, and the second is definitely a product of the computer age. Fashion design comes under the Family and Consumer Science Department, which in past generations would have simply been Home Economics. It’s been taught for the past 11 years by Mary Green, a former theology teacher who has a 25-year career at St. Hubert and taught before that at Archbishop Ryan High School. The fashion design course is popular and Bell teaches four classes to juniors and seniors. Most come in as juniors and maybe 40 percent stay on as seniors. When they start, very few students have ever touched a sewing machine before. But by the time they are finished they can more than hold their own, as four seniors can attest. Olivia Dees, for example, created and sewed an athletic wear ensemble. “I never sewed in my life before last year,” she said, explaining no one else in her family sews either. Next year she will be attending Eastern University, not studying fashion but early childhood education. Bailee Heim’s creation was a lace-trimmed tank top with a complementary skirt. Next year she is heading for Hofstra University, where she will study nursing. “I plan to continue sewing because it is a nice stress reliever,” she said. Zoe Gonzalez created a beautiful red cocktail dress. “I’m going to wear it for my graduation,” she said. She plans to start college at Bucks County Community College and continue on at Temple University for a degree in social work. She is also active in a theater program. “I’ll help make costumes,” she said. Kiersta Fleming came up with a boardwalk cover-up over a bathing suit. “I’ll probably use it this Saturday,” she said. She is headed for East Stroudsburg University to study for athletic training but yes, “I’ll keep sewing,” she said. This is fairly typical from Green’s experience. Very few of her students intend to take fashion design as a career. 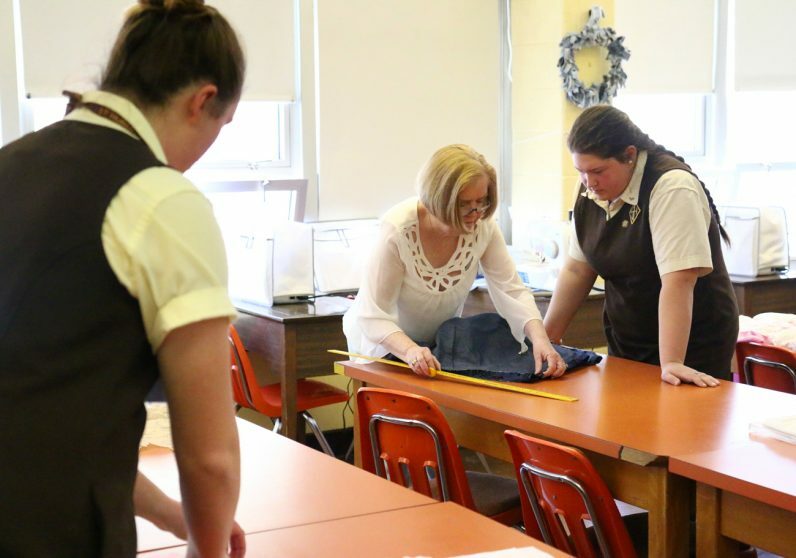 “I do have one student who is going into fashion merchandising,” she said, “and two years ago I did have a student who went into fashion design.” But whatever the girls at St. Hubert’s do in the future, while there, “this is a very popular course,” Green said. St. Hubert’s will showcase its students’ talent and creativity at a Pop-Up Fashion Show Monday, May 14 from 6:30 to 8:30 p.m. at the Union League of Philadelphia. To learn more, visit the school’s website. 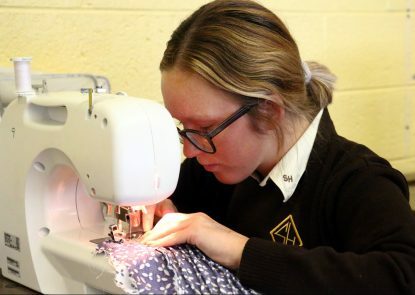 If fashion design is as old as civilization, robotics is in its infancy, and students who participate in it at St. Hubert’s might through their experience stumble upon a future career in a related field, perhaps engineering. The program has been guided for the past six years by faculty member Wayne Flood who teaches physical science, physics and chemistry. It entails students building a robot from scratch, which is entered in competition with teams from other schools or clubs. At the end of the year the robot is disassembled and the next class builds a totally different robot. “It is as hands-on as a kid can get in designing a project from start to finish,” Flood said. While this year robotics is an extra-curricular activity at St. Hubert’s, in the future if there is enough interest it will be listed as an elective course. Many other schools around the country do offer robotics either as club or course. Most are co-ed or all-boys schools, but the St. Hubert’s program is in keeping with today’s push to involve young women in previously male-dominated fields. Other schools in the archdiocesan system that offer robotics include Archbishop Wood, Bishop McDevitt and Lansdale Catholic, according to Flood. “Bambi-Botz” is an impressive robot weighing at about 120 pounds, according to senior Ryan Doherty, who has been part of the Robotics Club since her freshman year. The robot they built, thanks in part to corporate sponsorships, lifts and stacks fairly large objects and can even climb (no, it doesn’t sew). “I’ve gotten to understand more about engineering through this,” Doherty said. At this point Doherty, who will attend Drexel University, is not looking toward an engineering career but one in film. Nevertheless, “This has helped me to better understand engineering and science,” she said. Career or no career, building robots has to be a lot of fun. You don’t have to be a boy to appreciate it.